With more than 30 years of experience as a leading building products manufacturer, AZEK's technologically advanced and high performance materials are being used to renovate residential and commercial rooftops into idyllic outdoor living spaces. AZEK Decking and Pavers are premium, low maintenance products that resist scratches, stains, moisture, mold and mildew, and their lightweight properties and ease of installation make them perfect for many roof applications. 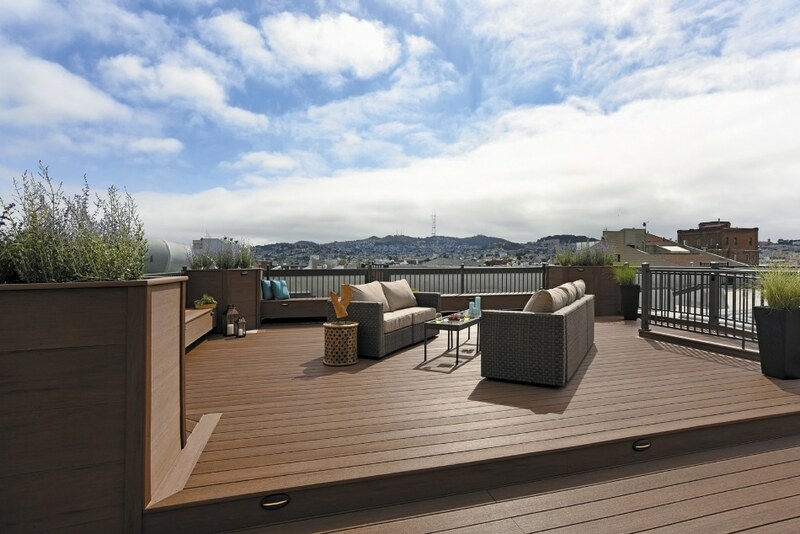 AZEK Deck's Vintage Collection in Mahogany is featured on a condo building rooftop in San Francisco. "AZEK has a long history of providing customers with top-notch products that are both durable and scientifically engineered to last beautifully," said Julia Fitzgerald, chief marketing officer of AZEK Building Products. "Our high standards of quality and durability have made AZEK Deck and AZEK Pavers the products of choice for contractors and builders looking to expand their clients' rooftop decks and outdoor spaces." When Steven and Brucie Schneider, of San Rafael, California-based construction company Schneider Construction, were tasked with solving a condo association's challenge of redoing a rooftop area that was once the site of a rotting, wooden deck, they turned to AZEK Deck's Vintage Collection in Mahogany, knowing it would provide the owners with a superior and long lasting new deck. "We specifically chose AZEK Deck because we wanted to create this space with materials that are sustainable and low maintenance," Schneider said. "The condo association and homeowners already dealt with a wood deck that needed to be replaced after only seven years. We knew that AZEK products would look beautiful, and AZEK Deck's 30-year fade and stain warranty and limited warranty are also major benefits to the homeowners." The Detroit Opera House is another project that has benefitted from AZEK's superior products. Utilizing AZEK Pavers, the building boasts a Sky Deck that multi-tasks as a nightclub space, outdoor yoga studio, wedding reception venue and more. AZEK Pavers, composed of up to 95 percent recycled materials, use a patented grid system that reduces installation time by one-third and takes the frustration out of manually setting and aligning heavy concrete pavers. "AZEK has the perfect materials to create the ideal outdoor rooftop, especially in a crowded city where space is limited and contractors have to get creative," Fitzgerald said. "Our premium, low maintenance materials, such as AZEK Deck and Pavers, offer unrivaled beauty and performance. Depending on the space, simply choose the product that works best and enjoy it for years to come."